The weekend of 8/9 July saw a grand start to new business when I attended the Synergy Surgery: Creative Health event. Science City York, Innovation York, York City Council and Knowledge Transfer Network – Creative Industries hosted a design and collaboration weekend bringing together creatives, academics and health professionals to work together. The project themes/needs were crowd sourced by the Innovation York digital forum Genius, and each delegate selected which theme group to work in. I joined the sharing real time health information group with five others. Led by two creative facilitators the groups set off on the Saturday morning to design service solutions, leading us through different stages of project planning, divergent and convergent thinking to enable design and filtering of ideas, customer journey mapping, using a range of different techniques like describe the service on one post-it, create personas for the potential service users/collaborators, prototyping and particularly in our group sketching. By Sunday afternoon we were presenting final concepts and competing for funding. Our dragons were the CEO of York Council, The Director of Public Health and an NHS Official and the funding was the new DIF fund which is now available. Both won funding from the DIF fund a new fund that has just opened in York. Since the weekend the group have created a core group for project consultation and I have taken on the management of the project’s future development. 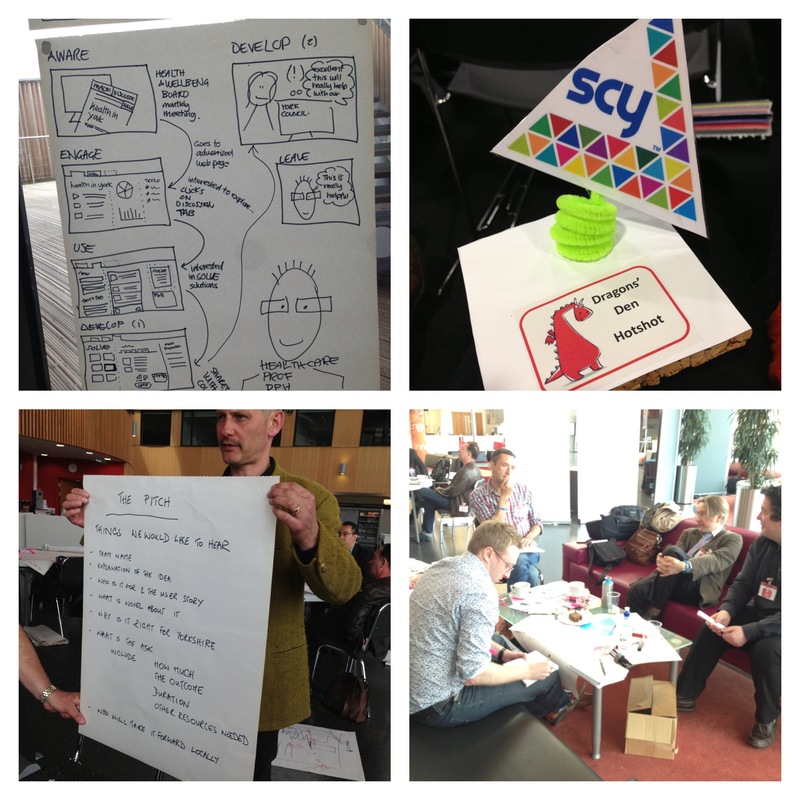 SCY and Innovation York are supporting the project development to development with a few to delivery in early 2014. Our business plan will be in for the board meeting at the end of August. All being well, we will be starting the first stage of the project in September… what a great start! This entry was posted in Design Events, Design Thinking, Health and tagged Health, innovation, Innovation York, SCY, York, York City Council. Bookmark the permalink.